You are currently browsing the Carpe DMM blog archives for January, 2011. “Catspaw” is without a doubt the worst episode so far in my systematic traversal of every episode of the original Star Trek. Alas, I know there is worse to come, and this one doesn’t really approach the depths of some of the later episodes. It’s not so bad that you remember it because of how bad it is. It’s just completely blah and unmemorable. It’s so unmemorable that it wasn’t until over 15 minutes into this episode that I recognised any of what was going on, despite having seen it before. This is yet another “Kirk and crew encounter nigh-omnipotent alien being, who toys with them until either Kirk defeats them through his cleverness or by deus ex machina” episode. And it’s easily the least inspiring of any of them. It features bizarre manifestations of “magic” and “spooky” stuff, including a trio of Macbeth-esque witches, some voodoo curses, a castle with a dungeon, and possibly two of the worst special effects seen so far in the series. Crewman Jackson beams up from the planet Pyris VII, without fellow landing party members Scotty and Sulu, and promptly drops dead on the transporter pad. Despite being dead, a spooky voice emanates from his unmoving mouth, declaring the Enterprise to be cursed. Kirk beams down with Spock and McCoy to investigate and find Scotty and Sulu. They find a spooky fog which is weird since there is no water anywhere nearby. They encounter three spooky ghostly witches, who try to scare them. They find a spooky Gothic castle and enter. It soon becomes clear that half this episode is padding, as they wander aimlessly around the castle for a bit before anything happens. McCoy and Kirk mention “Trick or Treat”, which perplexes Spock. Okay, fine, this establishes that Spock is an alien and knows nothing about human culture. But then later in the episode Spock turns out to be an expert on human culture, explaining to McCoy and Kirk what a witch’s familiar is. A spooky black cat jumps out, scaring them. They follow the cat and fall into a hole in the floor. Kirk, Spock, and McCoy awake in a dungeon, shackled to the wall. There is an intact human skeleton shackled next to them, in defiance of the fact that a human skeleton will fall apart if suspended like that. And there’s even a lame joke with Kirk addressing both McCoy and the skeleton as “Bones”. Scotty and Sulu show up, hypnotised. Kirk points out how they aren’t blinking, and Spock remarks, “Neither did Jackson just before he collapsed.” A perfectly fine observation, except that Spock wasn’t in the transporter room and never saw Jackson before he collapsed. 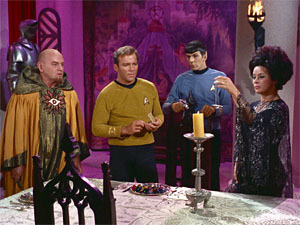 Scotty and Sulu take the captives upstairs, where they meet Korob and Sylvia, the semi-omnipotent aliens du jour. The only real twist here is that Korob an Sylvia don’t get along, with Sylvia wanting to extract some information from the humans at any cost, and Korob, who wants to try to get along, being shouted down. The information Sylvia wants is never actually explained, or in fact mentioned again. Oh, and Sylvia is the black cat from earlier, as strongly hinted at by the fact that the cat leaves the room and Sylvia enters a moment later, dressed in black and wearing the same pendant. Syliva pulls some voodoo magic on the Enterprise, heating a toy model of it in a candle, causing the ship in orbit to heat up. Kirk agrees to cooperate so she will stop it, then he proceeds to seduce her, but it goes awry and she judges humanity (ho hum, yawn, seen it before) and everyone ends up in the dungeon again. Korob releases them, but Sylvia turns into a giant cat and terrorises everyone with awful special effects shots of a housecat running through miniature castle corridors. Korob gives Kirk his wand and, in a confrontation with Sylvia, Kirk smashes it, destroying all the magic. The castle vanishes and Korob and Sylvia are revealed to be tiny puppets made of pipecleaner and feathers, complete with visible strings. They die, and that’s it. It’s all so cliché-ridden, and maybe 20 minutes of story stretched to fill 50 minutes. It was actually boring. It has two huge gaping continuity problems, and a major seeming plot point that is never explained. It has two laughable special effects. There is nothing clever in the plot. No wonder I didn’t remember any of this episode from the previous times I’ve seen it. Tropes: He’s Dead Jim, Ominous Fog, Haunted Castle, Padding, Cat Scare, You Fail Biology Forever, Gallows Humour, Plot Hole, Sufficiently Advanced Alien, What Happened To The Mouse?, Shapeshifting, Hollywood Voodoo, Casanova, Humanity On Trial, Mega Neko, Magic From Technology, This Was His True Form, Special Effect Failure. Body count: Crewman Jackson keeled over dead on the transporter pad, by “magic”, the aliens Korob and Syliva. “The Apple” is not one of the more memorable episodes. The title itself brought back no memories at all for me – it wasn’t until I got about 10 minutes in that I recognised what episode this is. Not a good sign. Kirk, Spock, McCoy, Chekov, girl of the week Yeoman Martha Landon, and four redshirt security officers beam down to Gamma Trianguli VI, lush with tropical vegetation and a lurid red sky. Chekov compares it to the Garden of Eden, which was just outside Moscow. Chekov has other Eden-esque activities in mind, as we (and Kirk) notice that he and Yeoman Landon are more interested in each other than their duties. Spock says the village they detected from orbit is 17 kilometres away, so they start walking – a very long way to walk, given they have transporter technology that could have placed them right there. This lapse of reason is never explained. As they set off, redshirt one bites the dust, thanks to being sprayed with poison darts from a lotus-like flower. Following this event, rather than beam back to the Enterprise, or beam down a botanist, or take any sort of precautions whatsoever, Kirk picks up the flower and sniffs it, and then they continue their slog through the jungle to the village. 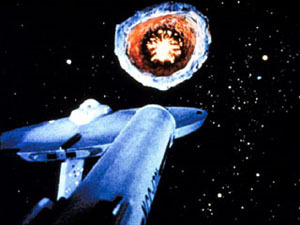 Spock finds a curious rock which he examines, snaps in two, then tosses aside – and it explodes on impact. Another flower takes aim at Kirk, and Spock pushes him aside but takes the full brunt of the darts. McCoy manages to revive Spock, thanks to his Vulcan physiology. The party realises the Garden of Eden metaphor is strained to breaking point, and Kirk tries to beam everyone up, but it’s too late, as Scotty reports interference from an energy source located near the village. With nothing better to do, they keep walking. Redshirts two and three are annihilated when one is struck by lightning in a sudden storm, and another steps on an explosive rock. Kirk expresses his self-doubts in an emotional speech. Spock interrupts to mention that a native humanoid is lurking nearby. Kirk intercepts the native and initiates a fistfight, but is taken aback when the native doesn’t fight back, but rather starts weeping and expressing puzzlement at being hit. 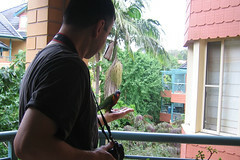 Kirk reassures the native that he comes in peace. The native says he is Akuta, and is the “Eyes of Vaal”, and leads them to his village, which is populated by about two dozen people, with no children or elders. They are confused by the concepts of children and love. Vaal has forbidden them! The natives take the crew to Vaal, which turns out to be a symbolically snake-like cave, where the natives leave offerings whenever Vaal calls. Spock decides Vaal is a machine, ruling the naïve villagers like a god. Spock and McCoy engage in a debate about whether Vaal needs to be stopped, and Kirk decides that yes, it does. But Vaal has also decided to get rid of them, telling the natives to attack the crew. Redshirt four goes down in the attack, but the crew best the rest of the villagers (including some well-aimed athletic kicks by Yeoman Landon) and then confine them to a hut. Vaal calls to be fed, but Chekov and Landon are enough to stop the villagers leaving. Kirk calls Scotty to phaser the snake-cave in its weakened state and this destroys it. They then tell the natives that life will be much better now, because they’ll be able to … um … make children now. They warp out of orbit, having interfered with another undeveloped alien civilisation. Well, this is really a pretty weak and uninspiring episode. The multifarious allusions to the Garden of Eden are possibly the most interesting part. Vaal is a serpent, the villagers are innocent. Kirk even eats an apple conspicuously when they are resting in the village. The denouement even has Spock pointing out that Kirk has effectively played the part of Satan by metaphorically giving the villagers knowledge of good and evil. But ultimately you want some actual drama in the story, and some sensible decision making by the characters, neither of which are particularly in evidence here. Body count: Redshirts Hendorff (killed by a flower), Kaplan (incinerated by lightning), Mallory (steps on a landmine rock), and Marple (whacked on the head by a native). I was wondering when something like this would happen. A microbiologist at the University of British Columbia has started ScienceLeaks – a place to collect links to peer-reviewed science papers that have been “liberated” from behind journal pay-walls. I’ve long thought that the scientific literature should be free to everyone to access. Science needs to move to a new publishing model in which this is possible. I’m a little concerned at what something like this might do to peer review in the short term – mostly because I’m not prescient and can’t foresee all the factors involved and how they will play out. Journals currently charge for access to papers because they need that money to support the infrastructure to arrange the traditional anonymous peer review system for every paper that gets submitted. Take that revenue away, and something else needs to happen. It may be possible for science to survive by people posting papers to free sites and having anyone (or any accredited user) post reviews of it, voting them up and down. But this could easily lead to favouritism or downright chaos, neither of which is desirable for science publication. However, I think science needs to move to a free availability model, and soon. The number of scientifically literate and interested people who want to see what our researchers are doing is growing, and hiding the best science behind pay-walls makes it look like there’s something to hide, breeding conspiracy theories and anti-science. My main criticism of this ScienceLeaks site is that it looks too small and doesn’t go far enough. I think it won’t be long before we see a science leaking site on a massive scale, aiming to publish every science paper free of charge. The revolution is coming. I hope the journals are thinking about this and have a plan for it, otherwise they’re going to be caught with their pants down and science could suffer an upheaval before things settle down into a new paradigm. “The Changeling” is the one I always remember as the episode version of the film Star Trek: The Motion Picture. 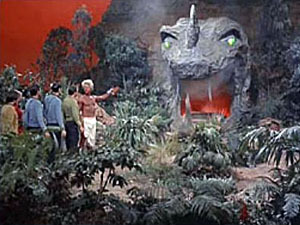 The plot is essentially the same on the large scale, so much so that it seems odd that during the film Kirk and Spock never once mention their previous experiences from this episode. The episode opens with the casual death of over 4 billion Malurians, when Kirk responds to a distress call from a Dr Manway (leader of a research team) and arrives only to find the entire Malurian system devoid of life. An unseen ship then starts shooting at the Enterprise, hitting it with incredibly powerful bursts of energy that threaten to overload the shields and destroy the ship. Kirk fires back futilely, then when all seems lost attempts to communicate. The mystery ship responds, and both parties establish they have no hostile intentions(!). Spock says the mystery ship is only a metre long, so they beam it directly on board the Enterprise to have a chat. 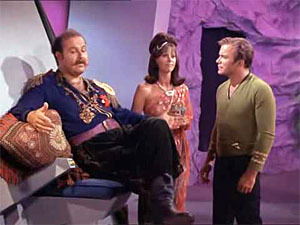 Kirk confronts Nomad over Uhura, who lies unconscious. 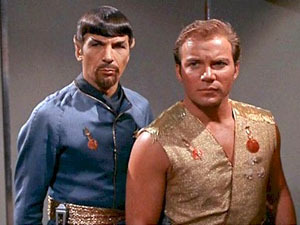 Nomad refers to Uhura as a “biological unit”. Spock gallantly comes to Uhura’s defence, saying, “That unit is a woman.” Nomad’s response: “A mass of conflicting impulses.” Nomad then offers to repair Scotty. Kirk tells Nomad to follow McCoy to sick bay; we see this from an eerie and unusual hand-held camera angle just behind Nomad’s PoV. Nomad brings Scotty back to life as if nothing had happened, but says it can’t fix Uhura, whose mind has been wiped clean. Nurse Chapel begins retraining Uhura, beginning with basic reading skills. Kirk questions Nomad more strongly. Nomad says it is programmed to sterilise all imperfect beings and declares that Kirk is the Creator, who created it. This confuses Kirk, who is about to deny it, until Spock, checking a library computer, interrupts and declares that Kirk is the Creator. Spock pulls Kirk away and explains that Nomad is an Earth probe built by a Dr Roykirk in the 21st century, and that it now thinks Kirk must be Roykirk. This could be the only thing preventing Nomad from sterilising the Enterprise of all life. Spock wants to mind meld with Nomad to learn more, and Kirk orders Nomad to allow it. Spock learns that Nomad was damaged and melded with an alien probe, getting their programming mixed up in the process. Furthermore, Nomad is seeking its origin – i.e. Earth – and if it gets there will probably sterilise the planet! Kirk lets slip that he is an imperfect biological unit, and Nomad goes on a bit of a rampage, disintegrating a few redshirts on the way to engineering, where it disables life support. Scotty declares that without life support they can only last— and in an interesting twist on the usual formula is cut off before he can give an amount of time. 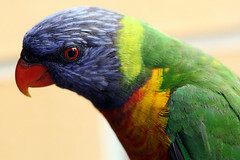 Kirk corners Nomad and tells it that it has made a mistake in thinking he is its Creator, therefore Nomad itself is imperfect and must be sterilised. This locks Nomad into a logic bomb and it blows itself up – conveniently just after Scotty beams it into space. 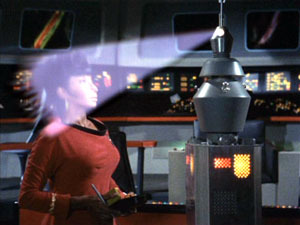 In the denouement, we learn that Uhura is up to college level education and will be ready to resume her role as communications officer within a week – i.e. conveniently before the next episode. Tropes: A Million Is A Statistic, We Come In Peace, Shoot To Kill, Bring My Red Jacket, He’s Dead, Jim, Contractual Immortality, Easy Amnesia, Thank The Maker, Crazy Enough To Work, Cooldown Hug, Disintegrator Ray, Red Shirt, Electronic Speech Impediment, Logic Bomb. Body count: Over 4 billion Malurians (off-screen, killed prior to episode beginning), Federation science team led by Dr Manway (off-screen, killed prior to episode beginning), four Enterprise redshirt security guards.